Scroll through your Facebook feed, and for every link to a long-form article, you will have to pass a healthy handful of viral videos. Are they industry specific? Hardly. Politics, entertainment, entrepreneurship advice, you name it, the verdict is clear: The preferred form is video. According to a report by Cisco, total internet video traffic (business and consumer, combined) will be 79 percent of all Internet traffic by 2020, up from 63 percent in 2015. But the data points to a larger issue, and one that is scaring one of the longest standing crafts of all time: writing. However, videos are only part of the equation. The larger shift that is happening is away from reading and more toward visual storytelling, which includes images. Content with images gets 94 percent more views than content without, cited another study. And according to a Citrix report, nearly two-thirds of the posts on social media are visual content. Here’s what’s fascinating: Despite the data telling us that images and video are a consistently rising trend, this is not to say that writing, in itself, is dying—in fact, far from it. One could say that writing is simply becoming more visual. Those images that get shared so often on social media? One of the most popular image types is quote graphics: images with text layered on top. Or the videos that fill your Facebook news feed? They are paired with banner text acting as headlines, piquing the curiosity of potential viewers. So even though data shows the human brain processes images at lightning speed—13 milliseconds—and that videos are processed by the brain 60,000 times faster than text, this ignores the simple fact that potent messaging is what draws someone in to begin with. Sure, reading long-form content requires a longer attention span and deeper cognitive efforts, but the act of reading will never disappear, since words are what give us direction. They tell us what we’re about to watch before we watch it. Therefore, the role of the writer isn’t vanishing. It’s evolving. High-performing images and videos are demanding that writing, if anything, challenge itself to be more condensed. Snappier headlines. Quick, meaningful quotes. The visual age is forcing writers to get to the point. So, how can writers stay relevant? And more importantly, what does a successful writing style look like in today’s digital world? Marketers especially, listen up: Since written and visual storytelling has become so intertwined, you have to think of them as two halves to the same coin. The question is not which one to choose, but rather the density of the blend. For example, combining an emotional photo with a powerful quote to create an image graphic is a great mixture for a platform like Instagram. It is not, however, a great fit for a platform like Facebook, since Facebook’s algorithm does not favor posts with more than 20 percent text. It’s a simple example, but a crucial one. Written and visual elements work together to tell lasting stories. For marketers, then, the question becomes how to properly utilize both based on the medium of choice—and what the users on those platforms are most comfortable engaging with. In addition, there are plenty of cases when writing absolutely trumps visual storytelling. Some would argue that reading a column or blog is easier than listening to a heavily detailed podcast— learning through reading versus listening. If you want people to think and learn something particular, consider writing. If you want people to feel, lead with the visual: video or imagery. If you look around, writing is everywhere. There truly is no shortage of words. From infographics to websites, landing pages to Facebook ads, the written word is alive and well. It just tends to get overshadowed by trends that hail the power of visual storytelling. A key part of making your writing stand out, then, is to frame it in the right context. This is where learning to work with designers can be tremendously helpful. By understanding how a designer approaches a piece of content, you too can learn how to shape your writing to fit within those constraints without losing any of its meaning or depth. The real benefit here, however, is that a single sentence framed by the right design can hold so much more weight in the visual age than an entire essay lost amongst a sea of other copy. 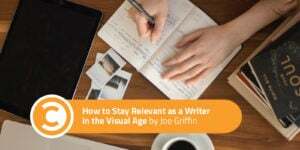 Learning to write with the awareness of the context created by design will not only help your writing stand out; it will allow you to reach and impact many more people whose eyes are on the lookout for something visual. Along with the changing responsibilities of the modern-day writer comes the acceptance that, sometimes, what you’ve written can be more powerfully told through a video, for example. Thinking like a screenwriter or a playwright gives you a significant advantage in the digital age. If you can be the writer behind meaningful videos and construct a story worth watching, your value will not be forgotten. In fact, the next time you see a video on the internet, take note of whether or not subtitles are included. Chances are, they’re there. When a viewer watches a video with subtitles, they are not only feeling the visual but reading the story as well—and the better the story, the more engaged they will be. Since so many people watch videos on their mobile phones, especially when they’re out and about (and may not have access to headphones), subtitles allow them to follow along. If you can write a narrative worth reading, imagine how much more engaged people will be with a coinciding video guiding them through. The craft of writing is not dying. It is simply evolving as consumer behavior changes.